When a puzzled young princess from a storybook magically appears, the group begins a quest to help her find her way home. On the journey, they swim with dolphins, see a beautiful mermaid and even meet a magician! But will the princess ever find her kingdom? 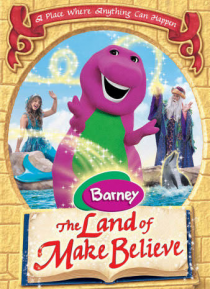 Will Barney and his friends make it home? Find out in THE LAND OF MAKE BELIEVE! Filled with fairy tale characters and familiar friends, it's a… story as big as your imagination!